Chicken Nihari - The Breakfast Curry! 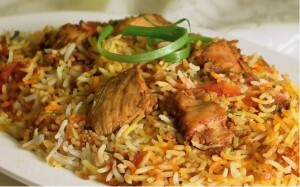 Easy Chicken Biryani recipe by Tracey at DesiRecipes.com. Small pieces of chicken in a creamy, spicy blend of onion, garlic, ginger, turmeric and tomatoes. Put chicken in pressure cooker with 2 cups water and cook for 10 minutes. In a fry pan, add onions and oil to coat and all spices and fry till very aromatic and until the oil separates. Add tomatoes and cook until oil separates again. When chicken is done, remove and save the broth. Fry the chicken in the tomatoe mixture for 5 minutes until it is very dry. Meanwhile, rinse rice and grease a crock pot with butter. Add the drained rice to the crock pot and put the chicken mixture on top of the rice. Measure the broth and add enough water to egual 28 oz of fluid. add to rice and cook on low for 6-8 hours. If you do not have a crock pot, par boil the rice for 5 minutes, drain. Grease with butter a casserole dish and layer the rice and chicken mixture and end with the chicken mixture on top. Add 4 oz water and cover and bake for 25 minutes. check for doneness. There are 9 comment(s) for this recipe. Are you sure you are cooking Biryani not paya!!!!!! its a crock pot people ...its not a chula you cook on for 6-8 hours. a crock pot is a slow cooker so you can leave things in it in and go run your errands and come back and lunch or dinner is ready.